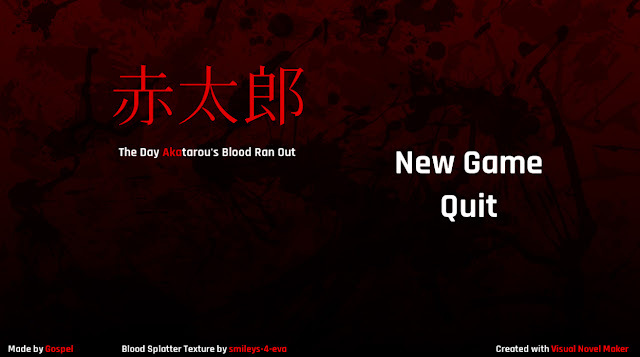 A Case Study: "Spring Stroll"
A Case Study: "The Day Akatarou's Blood Ran Out"
As mentioned in my previous post, from time to time I'd like to feature game mechanic insights here on the blog, especially in regards to other authors' games. Since I started worked on PBS I've been experimenting several ways of telling the same story in an interactive way, looking for inspiration in other works or emulating the games I was playing. During this process I mainly focused on my reactions and reflected upon my experience as a player, and it's now something that happens on a regular basis during my playtime or simply whenever I watch a movie or a tv show. What's the feature that makes a game entertaining to go through? What's the part that provides me the satisfaction of having played it? What's interesting and memorable? What shocked me? What made me do that jump in surprise? Lately I had the pleasure to play two short visual novels by two awesome authors and despite them being extremely quick (5 to 15 minutes) they offered a few things to reflect upon in terms of story techniques in the specific case of visual novel's telling. A case study: "Spring Stroll". 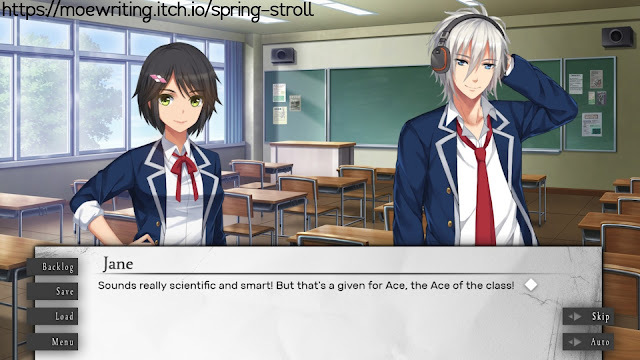 "Spring Stroll" deals with the main character, Ace who entertains the idea to take a stroll into one of his first spring days of the year. At first glance, I was fascinated by the nostalgic atmosphere and the lively dialogues between Ace and the heroine Jane. Later, I realized how the game structure is extremely enjoyable as well! Going through all the routes of this game is indeed the fun part of it! After all, one among entertaining features of playing a visual novel is going through it several times, isn't it? "Spring Stroll" makes a very good use of this device as Ace's backstory is split among the game's routes! Hitting a good ending won't make the story complete as you won't know all the details about Ace's solitary character. And ending up in a neutral or bad epilogue will make you think there's more to find out. Replayability is indeed one great feature in games like visual novel, and during my playthrough of "Spring Stroll" I was certainly surprised that it was implemented in such effective way! Surely impressed by the narrative, the dedication of the two authors (a beautiful CG art graces one of the endings) and the short time during which "Spring Stroll" was completed, I recommend this short game, as for me was a great example of VN development, along with the refreshing story it contains! A case study: "The Day Akatarou's Blood Ran Out". TDABRO is the short VN entirely made by Gospel. Be sure to get your copy here! Another feature that can boost replayability in a game is the same one that can push a reader to go through the same book a second time. That is when you get to the end of a story and that ending adds a new meaning to the whole experience. The foreshadowing is well camouflaged into the story. When reading through it I was so concerned about the main event, focused on how it's going to unfold, that I didn't pay much attention to everything that's secondary. Apparently, these conditions made the surprise work well! A second replay. After one play through I wanted to start it again to see the adventure with different eyes and check the foreshadowing part now that I could pay more attention to it. In my opinion, this could work because the ending itself added a different perspective to my experience. I recommend this game because it can make you laugh and you can be surprised in a 4-minutes span which is the cool part! My aim with this post was to deal about game mechanics and story devices in visual novels and I hope to have you gotten curious about the two games I mentioned as I was positively impressed by them and gotten eager to present them to you!